PCLinuxOS - the Big Daddy of Desktop Linux: Looking for a Decent Office Suite in Linux? Looking for a Decent Office Suite in Linux? I used to prefer Microsoft Office (on top of Crossover Linux) to OpenOffice for two big benefits - performance and compatibility. OpenOffice is a jumbo of a office suite. It has many feature, and more being introduced in each release. But performance-wise it's slow. What's more, it eats memory like a pig! For long I had been looking for a office suite for Linux that's light, feature-rich and fast. I tried KOffice - it's fast, but not as feature-complete as OpenOffice. Then switched to GnomeOffice. Sad! It lacks a presentation pack. The Agnubis has long been deserted. Last night I saw this Ashampoo Office 2008 on my friends Windows XP PC. It is just a tiny humble suite that consisted of a word processor (textmaker), a spreadsheet program (planmaker) and a presentation software (presentation). This suite takes just 39.77MB of install space, and 33.25MB of memory (when all the three programs are running)! Besides, it's not pricey - costs a fraction of what you pay for Microsoft Office. It has a Linux version too. 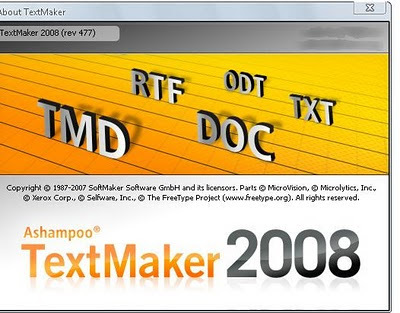 Lastly, Ashampoo 2008 has bundled just planmaker, textmaker and presentation, the combo most of the people use frequently. Finally, I would like to see OpenOffice shed some of its fat to be as slim, as uncluttered and as fast as Ashampoo. Or, better still, if somebody point me to a free Ashampoo Alternative in Linux. Till then I am using it. 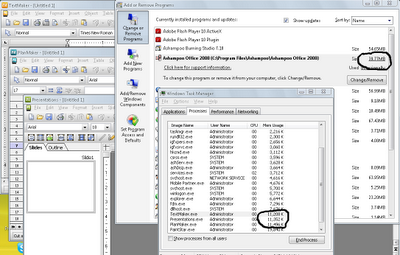 Please click on the image below to see the memory footprint and install space usage of Ashampoo Office 2008. BTW, Ashampoo (Softmaker) Office 2010 is already released. Good article. However I was surprised that you called it Ashampoo Office. The maker is Softmaker. Ashampoo is nothing more than a reseller, who sells older versions of Softmaker's Office suite. Softmaker is now into version '2010'. Thanks for info regarding the release of 2010 version of Softmaker Office. But all throughout this post I've mentioned it Ashampoo Office as that's what becomes prominent on clicking the about of button of this office suite. Softmaker is shadowed as fineprint. Have you tried Abiword ? Yes, I have tried Abiword. It's tiny and fast. In fact, I liked the combination of Abiword and Gnumeric, but lack of a presentation keeping in sync with the size and speed of these two apps makes me switch to Softmaker Office. good post, where did you get this idea?.